Yesterday someone online introduced me to Girl’s Day, a K-pop girl group. I was sick in bed with fever, and after watching hours of Hyeri in street events and interviews in YouTube, I decided I also wanted to get the Girl’s Day emoticons sold at KakaoTalk for $3, just like the person who introduced me was using. So far, a happy consumer wasting their money exactly as intended inside the system. KakaoTalk opened a Google Play Store payment popup, and said that I didn’t have a valid payment method. I figured it was because my Credit Card had recently renewed, so I went to the computer and re-entered my credit card information. It still says I do not have a payment method. I took a closer look, and realized that it had opened my workplace Google Apps account for payment. I have three Google accounts linked to my phone – my personal gmail, work gmail, and gmail that belongs to my employer as an organization. I have $3.50 in credits in my personal gmail account (from Google Surveys), so I am pretty intent on switching this to my personal account. I fiddled with the settings inside the popup, but there was absolutely no way to switch your account. I then went to KakaoTalk settings to see if anything was linked to my work account. Nope. In fact, it was linked here and there with my personal account. KakaoTalk was installed from the Play Store as I was linked to my personal account. My personal account was also the first google account I set up on my phone upon getting the phone, as is customary with Android. (Last I checked, which was around Eclair, some functions near the OS layer become hard coded with the first Google account that you sync with your phone, so you need to take special care in the order of accounts synced.) There is nothing that would hint my Kakao app to use the work account – it just decided to grab it, randomly, on its own. Once it grabs the wrong account, it does not allow the user to change it, effectively locking the user out of their original payments environment. (Usually their personal account) This is a sure way to discourage payments. Well, I did. 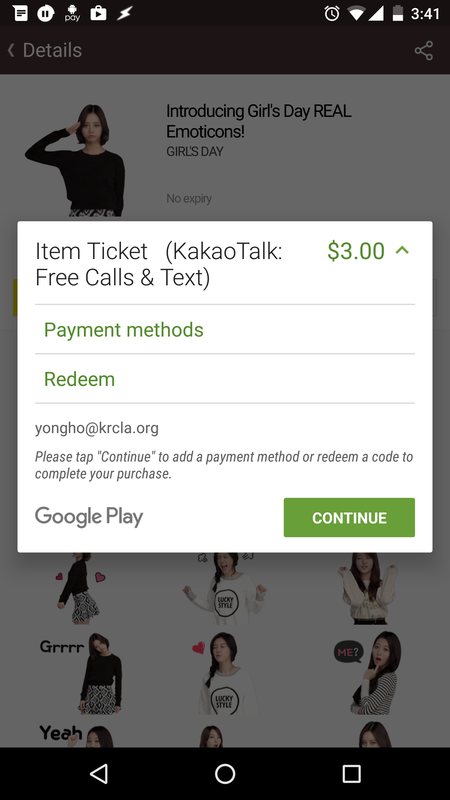 KakaoTalk, I’m trying to give you money for virtual goods. The cash is right here. 왜 줘도 먹지를 못하니? I am aware that there are some cognitively and developmentally challenged programmers and their managers in Korea, who seriously don’t give a damn about anything they produce except carding their timesheet every day. After all, Korea is an advanced industrial nation with a superior education system focused on math and engineering that has developed a number of technological marvels such as T Max Window and human stem cell cloning. That’s cool, it’s working as intended. But KakaoTalk is a company whose main product is an internet messenger application. Their first job is to create a product that can take well on the role of sending messages. Their second job is to make money. How many paid customers is KakaoTalk losing every minute because no one in their entire corporate decision making chain, from the coders to the PMs to QAs to execs, figured that dual Google account users issue could become a problem for making payments? Does KakaoTalk’s board know about this? Also, the fact that Kakao doesn’t grab the default account, but rather a random one, hints at the fact that this may be a pseudo intentional decision. Who made this smart decision? Google Apps is not a small phenomenon in the United States. According to Wikipedia, 5 million companies and organizations use Google Apps, including 60% of Fortune 500 companies. A growing number of state universities in the U.S. have adopted Google Apps for Education, meaning there’s a sizable chunk of college students on them. 90% of these users are likely to sync both their personal and work accounts on their smartphones. Do you hear what I am hearing? It’s the sound of millions of virtual coins falling to the ground because KakaoTalk is too dumb to care about, you guessed it, making money. 참 자알~한다. part of the reason why I care so much about in-person user experience optimization may be because how terrible, terrible, absolutely terrible the majority of Korean websites’ UX is. The Korean internets is filled with evangelists that have been decrying the lack of information architecture, cross-platform compatibility, disability access, standards compliance (W3C), data machinability… really, just plain lack of philosophy, in mainstream Korean websites for over 15 years now. It’s kind of when President Dae Joong Kim started pushing for growing the IT sector as one of the ways of overcoming the Asian financial crisis. Today, the White House website runs on Drupal and the federal government launched data.gov. In the meantime, the Blue House website uses Flash… oh nevermind, BH finally got rid of Flash. But I’m sure there must be other government sites that use Flash.. Election Administration, Congress, there’s gotta be a ton out there.. and it’s not for a slideshow or anything, Flash is used in the site navigation! Seriously!